Napier’s Ahuriri Estuary is home to a wide diversity of shore birds and with the formation of cycling and walking tracks is becoming an increasing focus for recreation. 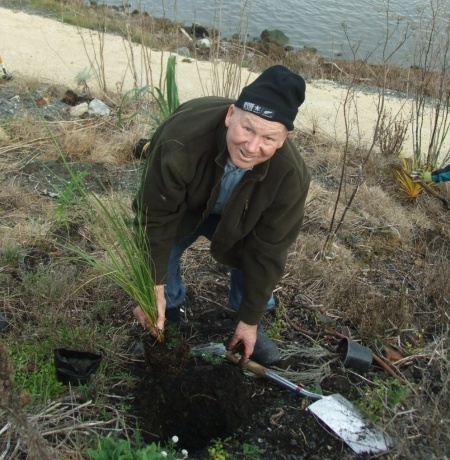 Along with Rugby Legend Ian MacRae and local supporters, Living Legends established over 10,000 plants in two areas providing security and habitat for wading birds along the farmland edge and re-vegetating the railway embankment. The Ahuriri Estuary is a unique and valuable habitat that resulted from landform changes associated with the 1931 Napier earthquake. This important wetland is a sanctuary for a wide variety of wading birds including grey herons, royal spoonbills and pied stilts and offers a significant opportunity for revegetation and ecosystem enhancement. Its closeness to Napier city provides great potential for community use and involvement in its development. The work already undertaken east of where Living Legends will plant provides a popular walking area and shows the value of native plantings in enhancing this environment. The man who spent seven years as an All Blacks centre is our Hawke’s Bay Rugby Legend. Napier’s Ian MacRae played 45 matches for the All Blacks between 1963 and 1970, and said at the time of appointment that it was flattering and close to his heart. “I am excited to be part of Living Legends as I started my working career as a forest ranger. I trained in conservation in the back country, trying to prevent erosion, so it’s quite fitting that now I am involved in this,” says Ian. Ian was born in Christchurch in 1943 and then schooled in Christchurch, Kowhiterangi (West Coast), Purakanui (Otago) before attending Rangiora High School in North Canterbury. As an 18-year old he played for West Coast in 1961 and for Bay of Plenty in 1962 (seven games). Ian made an early impact when he moved to Hawke’s Bay, scoring three tries in the province’s win over the touring England team. MacRae’s promise for the Hawke’s Bay and in All Black trials was confirmed with his selection for the 1963-64 tour of Britain and France. Though he subsequently attended trials, and was in the national under 23 team which toured Australia in 1964, it was not until 1966 that he made his All Black test debut. This was in the 1966 series against the touring British Lions where having moved to second five he was to prove an unqualified success. He remained a first choice through until the 1967 tour of Britain where he was made the All Black vice captain. Injuries disrupted his 1968 season and meant he missed the tour of Australia and played in only the first two tests against the touring French. He was fully recovered by the time the Welsh toured in 1969 and was again a leading player on the 1970 tour of South Africa, after which he stepped down from international rugby. In all, Ian MacRae played 45 matches for the All Blacks including 17 tests. Ian continued to play at provincial level for the Hawke’s Bay until the 1971 season, finishing with 85 matches for the union. He was a star of what was a golden period for Hawke’s Bay and among many notable feats he scored four tries in a 1967 Ranfurly Shield defence against Waikato. In the late 70s Ian was the Hawke’s Bay representative side’s assistant back coach and after a lengthy period on the Hawke’s Bay Rugby Union executive served as chairman in the late 90s. He has also served on NZRU’s then Super 12 Judiciary Panel and is life member at Napier Marist, Napier Old Boys Marist, Saracens RFU and Hawke’s Bay RFU. In 2013 Ian was elected President of NZRU. 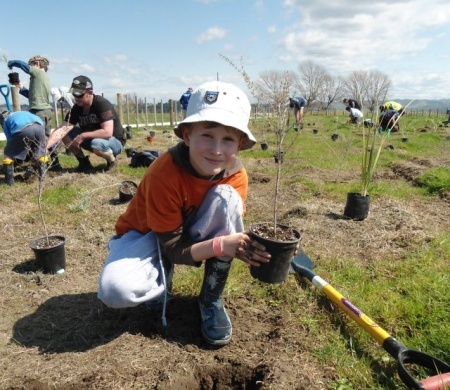 On Saturday 4 August, Rugby Legend Ian MacRae was alongside local volunteers, helping to plant around 2000 native trees and shrubs at the Ahuriri Estuary. This staggering achievement was part of the Living Legends project….